Question of the Day: Your thoughts on the Trayvon Martin Trial. We want to know what your opinions are of the Trayvon Martin case thus far. 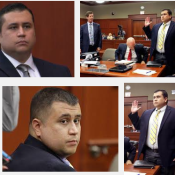 Specifically at issue is the Florida “Stand your ground” law that initially kept George Zimmerman out of jail until a public outcry led to his arrest and being charged with 2nd Degree murder. Now that we are entering the second week of the trial, we wanted to know your thoughts on how you think the trial is going for both sides. Sound off in our comments below this post. Don't miss a thing. Send us your email address, and we'll make sure to keep you in the loop. One of the greatest gunfights in film history? Your Bug Out Vehicle Plan! Copyright 2019. GunDebate.com. All rights reserved. The only way to stop a bad guy with a gun is to have a good guy with a gun.